Follow these steps and within 5 minutes or so you will have completed the setup. You need to install the Printix Client software on a Windows or Mac computer. Your computer must have access to at least one printer on the network and with at least one print queue installed, to experience the various printing features. If you intend to install on a fresh virtual machine you should add a printer first, so it can become managed by Printix. Printix Client will attempt to discover your printers and securely transfer necessary information to Printix Cloud. The Printix Anywhere printer is installed. Print queues are converted and their name is enhanced with a three-letter printer ID to make it easy to search for and identify printers. Learn how to best deploy Printix in your organization. Experience how you print with Printix and release documents from your phone. Sign up with your Microsoft account. 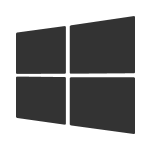 Sign up via Microsoft Azure Marketplace. Sign up via Microsoft AppSource. Sign up with your G Suite account. Visit printix.net and select Get started. Select Sign in with G Suite. You will be asked to Sign in with your G Suite account (not @gmail.com). Complete the install (step 7). Visit and Sign in to azuremarketplace.microsoft.com. In the search box, enter Printix. In the results pane select Printix Cloud Print Management and select Free trial. If you agree to the terms select Continue and you will be taken to Printix to complete the setup. You will be asked to Sign in with your work account. Accounts like (yourname)@(company).microsoftonline.com, should only be used if this is also an email account. If you see the checkbox Consent on behalf of your organization, it is because you have the role as global admin in Azure AD and Printix has not yet been accepted for all users. Check Consent on behalf of your organization so Printix can have access to the specified resources for all users in your organization. No one else will be prompted. 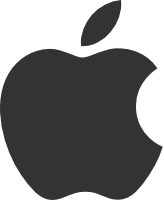 Visit and Sign in to appsource.microsoft.com. You will be asked to enter your Email address (step 2), pick a Password (step 5), and subsequently use your email and password to Sign in to first Printix Administrator (step 6) and then Printix Client (step 9) on your computer. Read the email: “Welcome to Printix” and select Get started. If you do not see the email within a few minutes then check your spam/junk mail folder. The link in the email can only be used once for activation and this must happen within 72 hours. Enter your Full name and Password. If you have signed up before, you are not asked to enter these again. Watch the optional introduction video (1:33) to learn how to install and get started. Select Next. Optionally select X to Cancel the Setup Assistant and go straight to the Dashboard. Install on your computer in a couple of minutes. Open and run the downloaded file and complete the Printix Client installation on your computer. If you see Sign in with Microsoft, select this and sign in with your work account. Sign in to Printix Client is automatic if your computer is Azure AD domain joined. If you see Sign in with Google, select this and sign in with your G Suite account (not @gmail.com). Otherwise enter your Email and Password to Sign in to Printix Client. 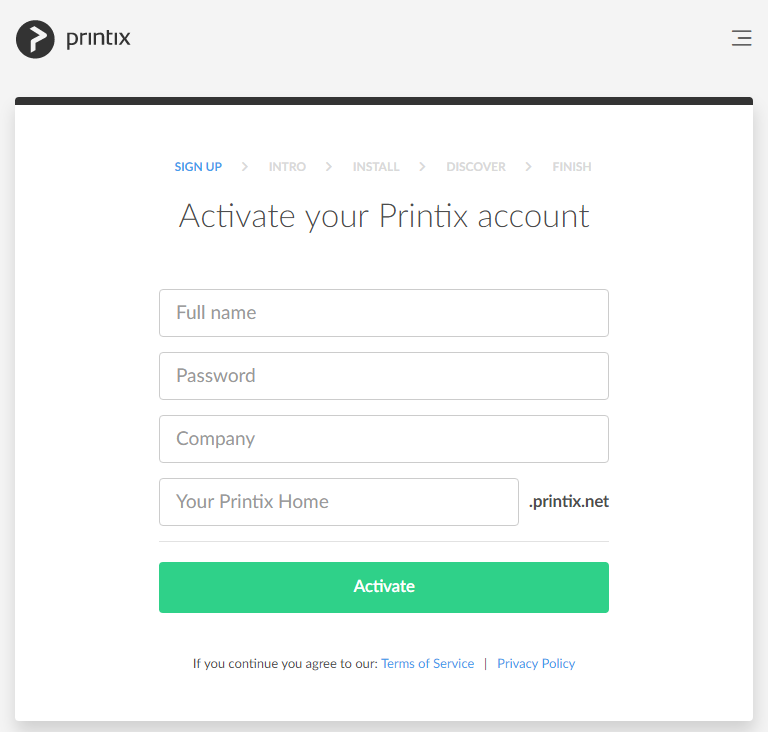 If you were not asked to sign in, then sign in via the Printix Client menu. Please wait a couple of minutes while Printix Client discovers your printers. If we did not find any printers you must enter the IP address (Example: 192.168.2.10) or hostname of one printer and select Add printer. If the printer fails to register it will appear on the Unregistered printers page. *If no printer was discovered and you do not have a printer available, you can proceed by entering for example: noprinter. Congrats! Your Printix Home is ready. Did we find your printers? If not all of your printers are listed on the Printers page, even after you select Refresh , it could be because your printers are on a different subnet than your computer. Please add a printer from that subnet manually and then do a discovery to find additional printers on that subnet. On the Printers page select Add printer . Use Discover to add printers. Printers that fails to register appears on the Unregistered printers page. 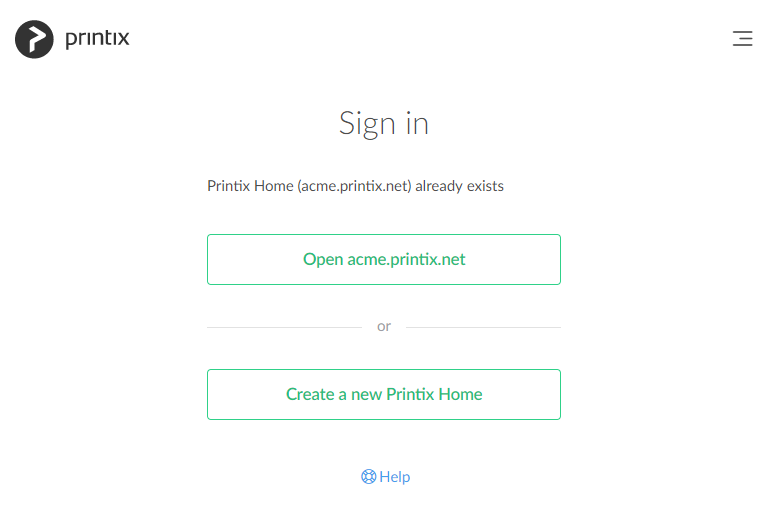 Select Open acme.printix.net to Sign in to Printix Administrator of your existing Printix home. If your role do not allow this you will see the message: Permission denied. Select Create a new Printix Home. Creating multiple Printix homes for the same organization is relevant if you want two or more teams to evaluate Printix independently. The Printix Client you download will not work with your existing Printix home as they are totally separate. On the Printix Client menu you can open Diagnostics to see what the Printix home is. *If you need your trial period extended, then please contact us.